Geetha's What To Watch: Glass, Serenity, and more! 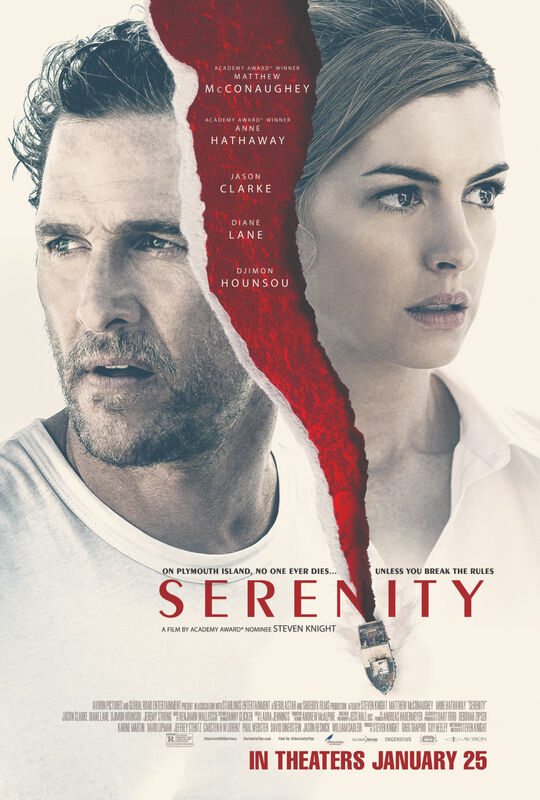 Home ☢ Movies ☢ Geetha’s What To Watch: Glass, Serenity, and more! Matthew McConaughey, Anne Hathaway, Diane Lane – all great names, here part of an unfortunate attempt at a noirish sci fi flick. Very sad indeed, since it’s coming from Steven Knight, who’s done some tremendous things in the past (Locke, for one? Most of the scenes in this spellbinding movie are of Tom Hardy driving.). This story is about an Iraq war vet (McConaughey) who’s presently a hard-drinking sailor mostly concerned with netting a big tuna he fondly calls Justice. Once in a while we see him with his girlfriend (Diane Lane). But then his ex (Hathaway) comes to town hoping he’ll help with a certain dark task. How was it for you? For those who don’t know—here’s the story: Kevin (James McAvoy) has surrendered to his dominant personalities (the Horde); and David Dunn (Bruce Willis) now secretly fights crime as the Overseer. Both wind up at Raven Hill—the facility also housing Elijah Price (Samuel Jackson). As Dr. Staple (Sarah Paulson) tries to convince her three patients they’re not superheroes, Price sets up his own plan to show the world that they are indeed that. It’s a nice enough showdown. The acting is excellent, as is the cinematography. But, keep in mind this is more of a psychological thriller – it’s more cerebral than action-oriented. Then you’ll love it. Yeah, it’s a YA flick… and your best bet this weekend. A kid (Louis Ashborne Serkis, son of Andy Serkis/ Snoke, The Last Jedi) runs for his life from schoolyard bullies, and, as he stumbles through a construction site desperately looking for something to arm himself with, yanks a sword-looking thing from a block of… cement? Yup, a sword. Cool! Now he can fight his bullies. The next day he finds out he pulled out… Excalibur. And that’s it for me! As always, it’s lovely to see you all again… I’ve missed you. Here’s hoping I’ll see you at the theater!